Publisher: Woodley Memorial Press, 2011, Paperback: 209 pages, ISBN-13: 978-0982875254, $15. 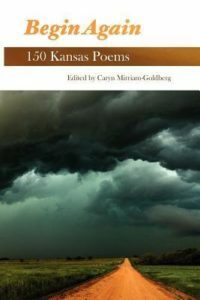 Begin Again: 150 Kansas Poems, edited by Caryn Mirriam-Goldberg, Poet Laureate of Kansas, celebrates the spirit of Kansas in the state's Susquicentennial year. Exploring how magic can be found in and beyond our own backyards, this anthology journeys into beginnings and endings, dreams and desires, departures and homecomings all rooted in the Kansas land and sky. Step into this book, and land in poetry that illuminates the extraordinary around us all the time. This book is based upon the 150 poetry project, a blog that also features a150-part renga written by 150 Kansas poets, plus a poem of the week for many years. Poets included: Lorraine Achey, Abayomi Animashaun, Marie Asner, Jackie Magnuson Ash, Anne Baber, Walter Bargen, K. L. Barron, Roy J. Beckemeyer, Allison Berry, Elizabeth Black, Lori Brack, Mickey Cesar, Victor Contoski, Maril Crabtree, Daniele Cunningham, Rebekah Curry, Brian Daldorph, Jan Duncan O'Neal, Eric Dutton, Paula Glover Ebert, Harley Elliott, Dennis Etzel, Jr., Melissa Fite, Amy Fleury, Greg German, Diane Glancy, Katherine Greene, Anne Haehl, Joseph Harrington, William J. Harris, Serina Allison Hearn, Bill Hickok, Steven Hind, Jonathan Holden, Hazel Smith Hutchinson, Nancy Hubble, Jennifer Jantz Estes, Judith Bader Jones, Kathleen Johnson, Michael L. Johnson, William J. Karnowski, Ken Lassman, Robert N. Lawson, Philip Kimball, Gary Lechliter, Stanley Lombardo, Katie Longofono, Denise Low, Dixie Lubin, Jim McCrary, Ramona McCallum, Jo McDougall, Eric McHenry, Stephen Meats, Lee Mick, Ronda Miller, Caryn Mirriam-Goldberg, Marilyn Pollack Naron, Rick Nichols, Amy Nixon, Karen Ohnesorge, Al Ortolani, H. C. Palmer, Dan Pohl, Matthew Porubsky, Kevin Rabas, Thomas Reynolds, Linda Rodriguez, Judith Roitman, Mark Scheel, Elizabeth Schultz, Leah Sewell, Melissa Sewell, William Sheldon, Roland Sodowsky, Kim Stafford, William Stafford, Mary Stone Dockery, Olive L. Sullivan, Mary Swander, Patricia Traxler, Roderick Townley, Wyatt Townley, Gloria Vando, Timothy Volpert, Diane Wahto, Laura Lee Washburn, Israel Wasserstein, Iris Wilkinson, Donna Lynn Lash-Wolff, Peter Wright, Pamela Yesner and Max Yoho. Excerpt: William Sheldon's "The Perfect Poem"